One of the few standardized tests that assesses the analytical reasoning skills of college students is the Collegiate Learning Assessment. The Mastery Level of the CLA+ requires students to solve an analytical reasoning problem and write about it. 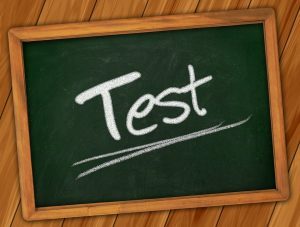 Some scholars believe that the performance tasks in this test are too general and too easy. However, even if the score is slightly inflated, this news is still not good. 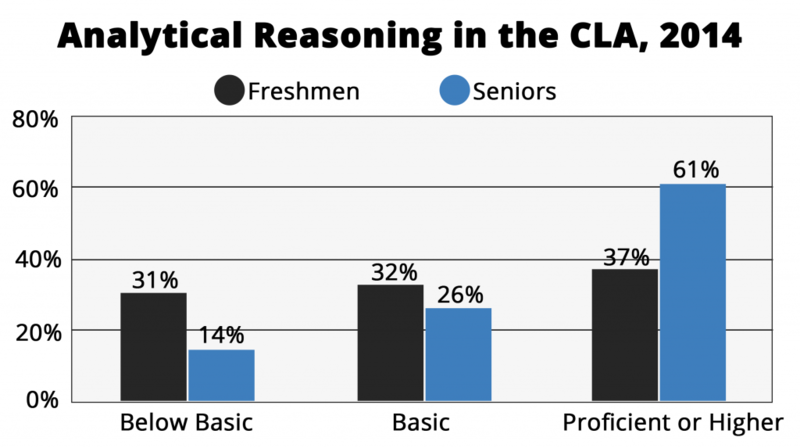 Two-thirds of college freshmen are not proficient in analytical reasoning. Equally concerning is the fact that four years later, after the less proficient students have dropped out of the system, the more select group of seniors is only 61 percent proficient in analytical reasoning. This evidence seems to back up the complaint of employers that the graduates that they hire do not possess quality problem solving skills. Students are actively using application and analysis learning behaviors. Students clearly understand the breakdown of the analytical process and can evaluate their choices alongside other possibilities. A professor-led discussion of the conclusions, as well as a review of the analytical processes that led to the conclusions. 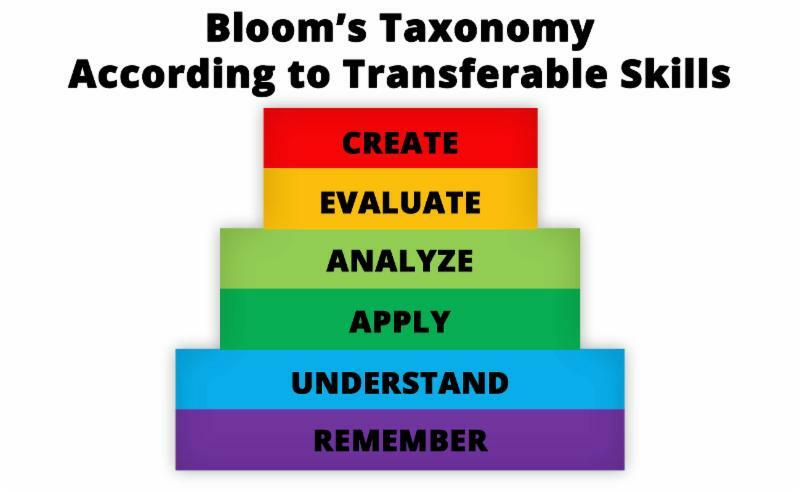 A look at Bloom’s Taxonomy shows once again that analytical reasoning uses all the learning behaviors that appear in the charts I’ve presented. Professors do not have to turn their courses upside-down in order to make these changes. In fact, I encourage professors who are transitioning from traditional, lecture-only teaching styles to go slow, steady, and small. The more exposure that students have to these small active learning opportunities, the better. You should learn how to manage students, develop your own discussion style, and experience what works best for you and your students before trying more ambitious activities. Forty percent of the time, students are not attentive to what is being said in a lecture. After the first 20 minutes, student attention drops off dramatically. Students retain 70 percent of information in the first 10 minutes of lecture, while they only retain 20 percent of the information from the final 10 minutes of the session. Below is a physical representation of how the attention span works in a traditional lecture setting versus an active learning lecture structure. In the traditional lecture, there are 20 minutes of high attention followed by 30 minutes of weak attention, and, finally, 10 minutes of low attention. An active learning lecture setting on the right incorporates several activities and learning behaviors from understanding, to analyzing, to evaluating. These activities periodically revive the brain’s ability to attend and participate. The first 5 minutes involve a poll or quiz to introduce and pique interest in the lecture. This segment is followed by 25 minutes of traditional lecture, which occurs within the timespan that students still maintain high attention levels. In the third segment, however, students switch gears. They form groups among themselves and discuss the independent work they have completed on an active learning problem that is related to the lecture and they process to discuss their findings with one another for around 15-20 minutes. In the final 10 minutes, the professor discusses the conclusions of the activity with the whole class. If there is an additional 15 minutes of class time, the professor may return to lecture, confident that the students are beginning a new attention cycle and will retain what is now being presented. In other words, these texts are not beach reading for students; on the contrary, they fall decidedly outside the average student’s comfort zone. To really master the knowledge contained in the reading, one must exercise the disciplines of reading, re-reading, reflecting, asking oneself questions, prioritizing concepts, and considering the author’s intent and choices. Reading specialists call it “gist” or “one and done” reading, where the student barely scrapes the surface of the reading and retains very little of its content. Thirty percent of students either don’t buy the text or do buy it but “wing it” instead of reading the assigned texts. Another problem is that professors sometimes capitulate to the no-reading problem and simply test on the lecture material rather than on the assigned text. Students use the professor’s study guide and the index of the text or search function on a digital text to look up the terms and “wing it” on the test. I have found that the brief, complex academic texts that I want students to close read are about 4,000-5,000 words of disciplined weekly reading, or about 12 pages per week. Overall, however, I want students to read closer to 30 pages per week, as this is also recommended by reading specialists. Because of this, I supplement the close reading with ease reading in the form of narrative books and papers at the general or popular reading level of grade levels 8-9. The combination of the academic text and two supplementary books or a collection of articles per semester has worked well for me. I also know that this meets the recommendations of reading specialists who suggest 150,000-200,000 words of assigned reading in the college classroom. Beyond the question of quantity, a disciplined reading strategy must also be established. The basic formula is this: the more your students struggle with academic reading, the more necessary it is to breakdown or “chunk” the reading material, and the more important it is to test your students with frequent quizzes. I believe that a 2,000-word chunked reading (5-6 pages) is the minimum that should be assigned to a college student. 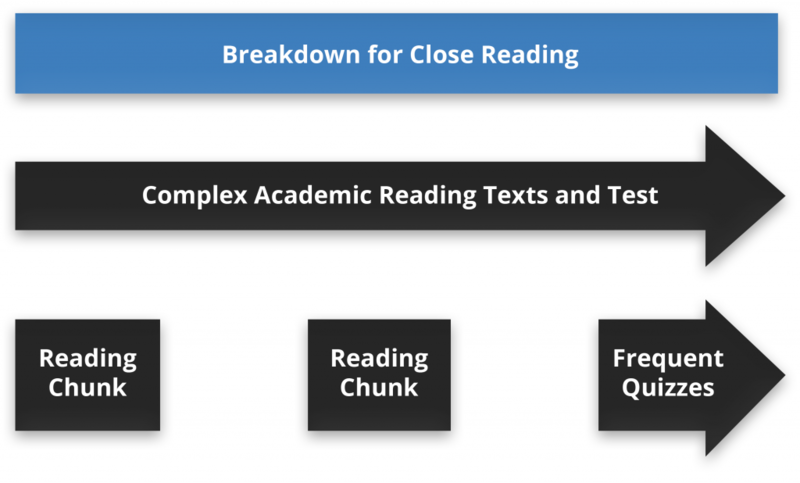 If you have a student who cannot sustain reading for 5-6 pages, even with support, they may be too far out of the range of college-level reading proficiency. Finally, you want to be sure that the frequent quizzes you are assigning contain questions that are detailed, conceptual, and inferential and which can be linked directly to the study questions and signal words and phrases. You may allow the quiz questions to be on the easier side in the beginning–however, you should make sure that you are not assessing answers on a study guide, but drawing from the actual assigned reading. This ensures that the students’ reading comprehension levels can be evaluated and improved. The reading level of students entering college is rather elusive, but it is usually calculated in one of two ways. One is based upon the national average of placement scores, which indicates that about 50 percent of entering freshmen read at a grade 12 level. Alternatively, “The Nation’s Report Card” of the NAEP indicates that about 38 percent of graduating high school seniors read proficiently at a grade 12 level, which would suggest a proficiency level percentage in the mid 50s for the group that will enter college. In addition to these estimates, a highly publicized study by the Renaissance Learning Organization determined that the reading material of college English classes is on roughly grade 7 level, which led the RLO to conclude that, in reality, college students really don’t read beyond the middle school level. Let’s move beyond the battle of statistics for a moment and look a little more deeply at how the transferable skill of college reading relates to the larger picture of college graduation and employability. 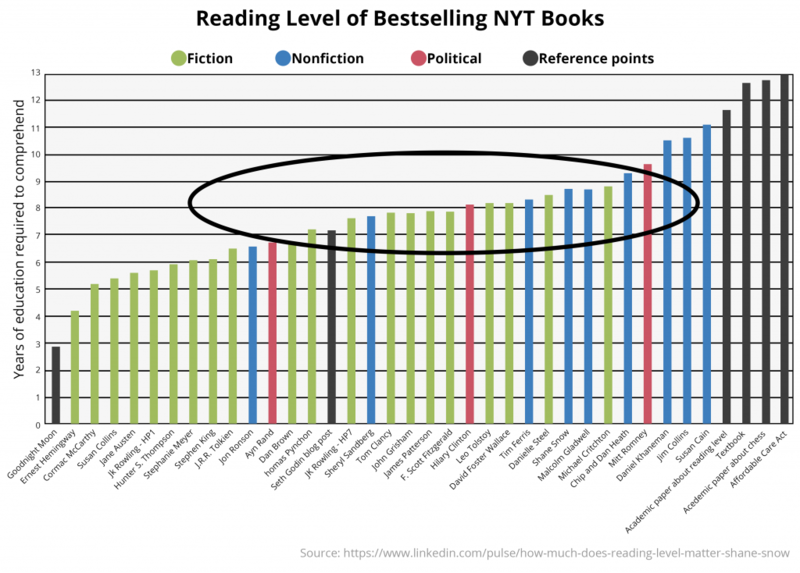 The chart below tracks the reading levels of books on the New York Times Bestsellers List, as well as those of other types of literature. There are a few key pieces of information to note when observing this data. First, the bestselling books fit into a grade 8 reading level (highlighted by the oval). Next, note that fiction literature generally falls within a lower reading level than does nonfiction literature. Finally, notice that academic papers, textbooks, political literature, and government reports–indicated by the bars on the right–are distinctive in that they fall under the much higher difficulty level of grades 11-12. How do we explain this data? 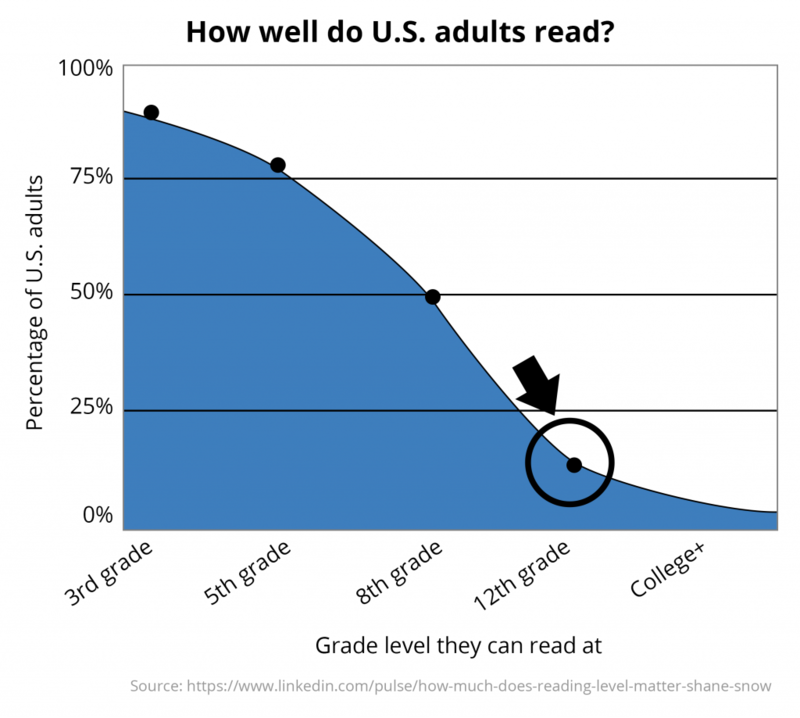 First, the median reading level of American adults is around grade 8, as detailed in the chart below. If bestselling authors, such as Malcolm Gladwell, intend to sell books, they need to write for the median audience. Although many people reading Malcolm Gladwell are probably capable of reading at a higher level, a grade level 8 is a comfortable one, for which one doesn’t have to strain, slow down, re-read, and reflect too often. While tempting, it would be unwise for professors to eliminate these uncomfortable characteristics, or to “dumb down” their readings. In fact, I want to suggest that academic reading should be thought of as the training ground for “work” reading–that is, the complex memos, reports, data, and topical readings of modern, professional employment. The real takeaway here is that successful, well-educated people prefer to read at grade 8 level, but they work at the level of grade 12 or higher. So, what is the strategy for training students to develop a “work” reading mode? Reading specialists tell us that “close reading” is the best way to teach those who read comfortably at grade 8 to cope with and learn how to read less comfortable but necessary grade 11-12 academic texts. The chart below lists the three basics of this strategy. In the next blog, I will describe the mechanics of close reading in the lower division classroom. Leave a comment on What Does the Transferable Skill of Read/Study Mean? Author Patricia DonPosted on September 16, 2017 September 21, 2017 Leave a comment on What Does the Transferable Skill of Read/Study Mean? Recently, social scientists have discovered a few facts that speak to the “American Dream,” or upward social mobility that is promised to hard-working Americans. 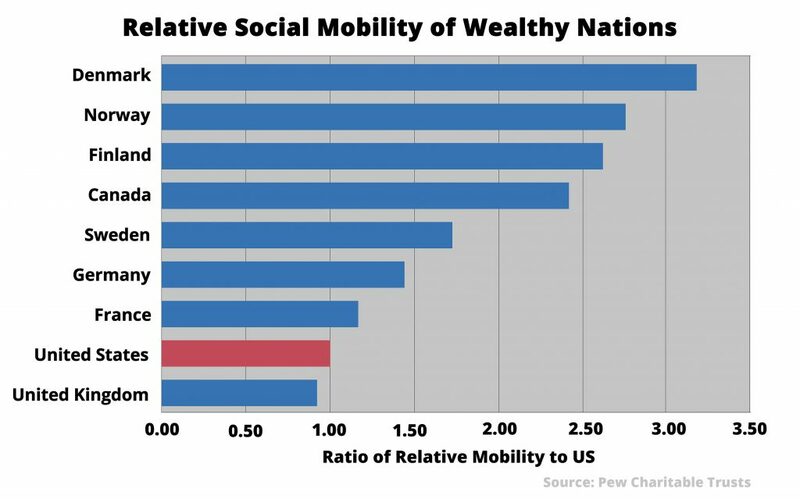 Below is a chart demonstrating that the United States is second to last among other developed countries in relative social mobility (defined as the socioeconomic position of 40-year olds compared with that of their parents). American social mobility has been slowing down compared to other wealthy countries, especially since 1980. I emphasize social mobility because it is an important underlying theme in today’s political climate on both sides of the aisle. It is obvious that Americans treasure this “Dream” and have become very disappointed that it does not seem to be coming true for them. They are frustrated by what they perceive as their leaders’ lack of sufficient attention to this massive problem, and they want a fix sooner rather than later. As you might expect, the root cause of this decreasing relative social mobility is complex, and there are no easy ways to repair massive socioeconomic shifts like this one. Globalization and, even more importantly, automation have resulted in the loss of many US jobs–especially lower-skilled fields such as manufacturing. These trends, regardless of political efforts, will continue to accelerate. To revive the American Dream, middle and working class Americans need leaders and institutions that help them work with and around these long-term economic trends. This brings me to a very important finding uncovered in these studies. In America, a parent’s income level–and, by extension their education level–is a far more predictive factor of a child’s socioeconomic future than it is in any other developed country. Achieving the American dream has almost become dependent upon completing a college education. The graph below illustrates this finding. The net new jobs figure is an important statistic for economists because it anticipates future employment trends. In a recession, businesses go through the painful processes of laying off employees and shutting down facilities in order to then take advantage of their newly cleaned slate to reposition their companies for the future. This means hiring employees who they believe will help the company thrive in the long run. Thanks to the following study, we now know who these new employees are. 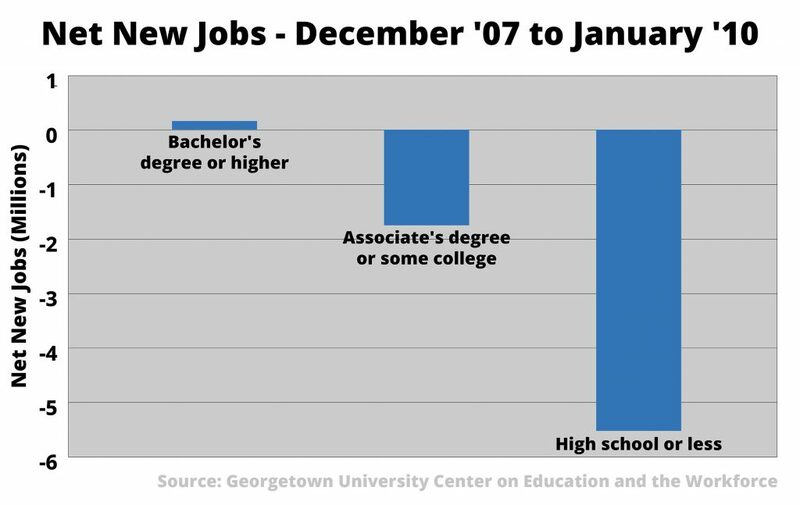 Over 70% of new jobs since January 2010 went to people with a bachelor’s degree or higher, while less than 1% of the new jobs went to people without a college degree. The Great Recession practically took down the “Applicants Wanted” sign for high school graduates, while also maintaining a climate that was not particularly welcoming to graduates with just some college. According to the National Student Clearinghouse, the 6-year college graduation rate in the US currently hovers in the low 50s percent range and, unfortunately, has ticked down slightly in the last few years. The takeaway for college professors is this: concentrate on what will move a significant number of the “some college” students into the graduated column. What is a significant number? Just a 10 percent increase in the national college graduation rate would elevate the US to near the top of the world list in relative social mobility. This blog is part one of a six-part series. In future blogs, I will explore how we can collectively improve graduation rates and, as a result, provide ladders of opportunity to our youth. Look for part two of this blog series, “The Importance of Transferable Skills,” this Thursday. Writing is the most difficult, and yet the most valuable transferable skill. Unfortunately, few students arrive at college with the ability to write proficiently, and not many become proficient writers while attending college. Various studies indicate that the percentage of entry-level freshmen who write proficiently at the college level ranges from the high 20s to the low 30s. A recently published and notably provocative book about the lack of learning that takes place in college, Academically Adrift, bemoans the fact that college students are not asked to write enough. Students who were surveyed reported that they were only asked to write a total of 20+ pages in about 50 percent of their college classes. Based on my own experience, I suspect that these numbers are inflated. First, proficiency tests are based on writing prompts and samples that are at a much simpler level than those required by the social science minimal writing standard (which is about 8 pages worth of thesis-driven argument that integrates a variety of evidence sources and material). Moreover, a minority of students in my own surveys of undergraduates at a four-year university indicated that they had written more than 5 pages in lower-division college courses, let alone 20. I believe that about 15-20 percent of college freshmen are proficient in social science writing. As a result, my goal was to train another 40 percent of students in a lower-division history course how to successfully craft and compose a standard social science paper. In my experience, prioritizing history writing in lower-division courses was both gratifying and beneficial. Student evaluations read: “This is the first time in my life that a teacher has really showed me how to write.” It turns out that students do not balk in the face of a challenging writing assignment if they have a clear, detailed road map that lays out exactly what is expected of them. 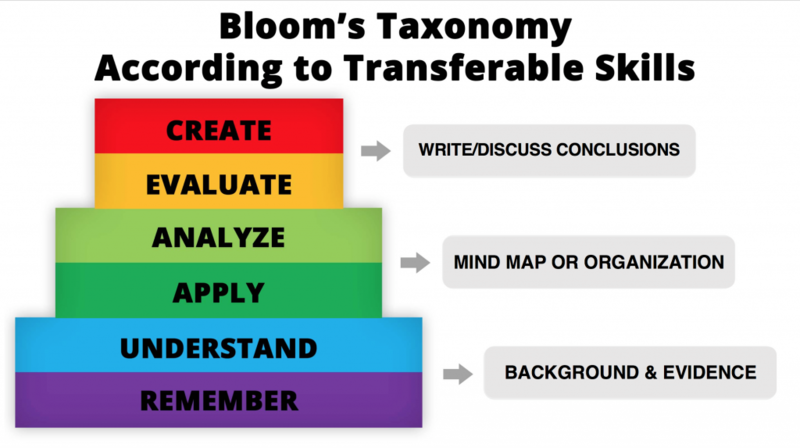 A solid writing training program depends on the integration of all the learning behaviors in Bloom’s Taxonomy. Break down the steps of the writing process to meet the specific needs of a social science paper. Design an explicit and clear set of instructional scaffolds that build students’ critical thinking about each step of the writing process. Set up writing groups and submission procedures for a series of informal and formal assessments. The chart below demonstrates the writing project plan for a GE standard 1500-word history paper. The real secret sauce in this writing process is the detailed, scaffolded activities in the middle column. Why? Because the professor must be an activator, not a facilitator, of the critical thinking that is involved in the writing process. Some activities and learning behaviors can be completed independently and online, but they should be brought to a professor-led classroom discussion for review and analysis. The image below provides a visualization of the breakdown of the thesis-writing step in the essay-writing process. The professor can begin by instructing students as to the qualities of a strong thesis, as well as the markers of a weak thesis. Students then complete an online quiz in which they are asked to select the superior thesis in a choice between two theses. The professor then follows-up by including a discussion and analysis of these quiz items in the next week’s class. A couple of days later, students submit their individual theses to the professor for checking, revising, and approval. In my estimation, social science professors who want to participate in the generalized improvement of students’ writing level in the lower-division courses will need to contribute 10-15 minutes of classroom time to this project each week. Although this does involve grading the crafted parts of students’ papers twice before grading the end product, it does not take much more time than grading a very bad final paper in which students have been left to their own devices. Detailed, scaffolded activities also require a little bit of time to learn how to activate, but within a couple of semesters, composing them becomes quite simple and will feel like second-nature. Yes, a professor does have to give up a little bit of time and self-training to teach writing and composition skills effectively. However, in gauging whether or not it is worth your extra time, you only have to remember two numbers: 86% and 88%. These are, respectively, the percentages of college professors and employers who believe that writing effectively is a very important transferable skill-one that is critical to students’ future prospects in the job market. I add a question mark to this title because most people when they think of active learning do not think of a lecture. 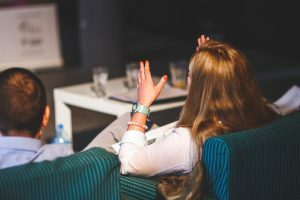 A lecture by its very nature is supposed to mean passivity on the part of the student, and active learning means student engagement in their own learning. But the first part of that statement is simply not true. As I noted in my last blog, lecture that is handled well in the classroom can be incredibly active. Today, professors are finding ways to create a lecture experience that makes the classroom a dynamic place and gives more responsibility to the student. 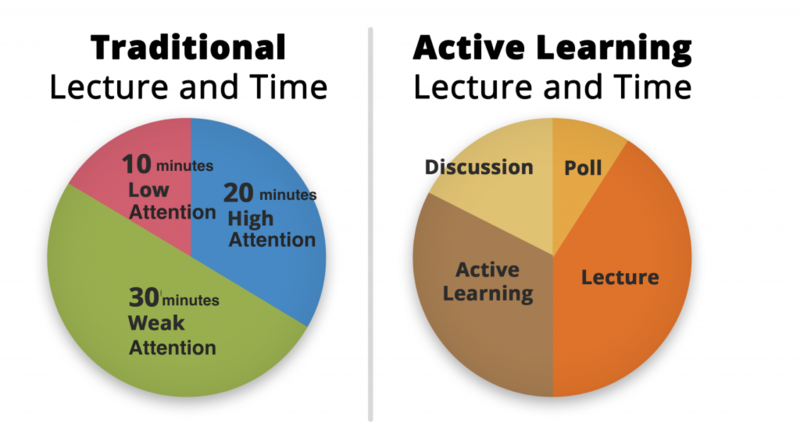 In order to transition to an active learning lecture, there are five principles to observe. Reduce lecture duration to 40-60% of the available classroom time. Move factual information to reading or online listening and leave more challenging conceptual information to lecture. Provide structure and good visuals without bullet points to your briefer lecture. Poll students during lecture for both opinion and understanding. Offer an active learning assignment for before or after the lecture. Even the best lecturer has a hard time sustaining student attention past 20 minutes–according to science, the limit of sustained attention span. If your class is 75 minutes of lecture, you are truly asking for nap time. If you are naturally a good speaker and have a very engaging lecture style, you can talk for 45 minutes. But if lecture is not your strength, consider limiting yourself to 30 minutes as a standard practice. Make Conceptual Information Shine in the Classroom. I have observed enough lectures to know that, in the social sciences, about 75% of a 75-minute lecture is simply recitation of facts that a student could get by reading a book. Many professors admit to me that they are lecturing in parallel to their assigned reading texts, and students end up not doing the reading. But almost all lectures by a well-trained academic have a conceptual core, where there is real benefit in having a person explain it. It is this 30 minutes of concept explaining that should shine in the classroom. The other 45 minutes of factual information can be left to the students reading at home or by simply putting the remainder of your PPT online and creating a voice over–the flip in what is known as the flipped classroom. When you confine yourself to a 30-45 minute lecture, you can put more effort into a quality lecture with 3 attributes. (1) Choose a subject for the lecture that can be explained in 1500-2500 words (about 5-9 pages double spaced if you were to write it out). (2) Create a 3-part structure like a well-written essay, including an opening hook to engage the students, a clear thesis with several points, and a final summary. (3) Make a visual PPT with 10 quality visuals that illuminate what you say about every 2-4 minutes. By illuminate I mean images that have some detail and are directly on point with your lecture. There are no bullet points in a quality lecture–the scientific literature on this issue is absolutely clear. The minute you put up bullet points, it is a signal to students to stop listening, start copying, and go into zombie mode. You want a lecture where all students are engaging, not just the top 10 students. To ensure this, there is a new lecture idea called the “punctuated lecture” that builds poll technology, readily available today, into the lecture and actually grades students for lecture understanding in real time, not 5 weeks later. First, make sure that the poll technology you use will give participation points for student opinion with multiple choice, true-false, and free response answers, but also gives varying points for right and wrong answers. Create provocative opinion questions for the start or end of the lecture, and a couple of right-wrong answer questions for the middle of lecture to check for student understanding. Practice keeping your discussion of these questions to 1 minute of implementation and 2 minutes of discussion, which provides about 12 minutes of punctuated engagement time for each 30-45 minutes of lecture (about a 25-30% ratio). This is a larger subject for another blog, but active learning assignments of this type have 4 features. (1) They use primary sources, case studies, and actual evidence, because the student is practicing being the social scientist. (2) The exercise has an analytical question and the student must use the evidence to answer the question. (3) The assignment is related to the topic of the lecture or the general topic of the week, so that the lecture and the assignment work hand in hand. (4) Generally, it is best if the student does most of the assignment outside of class; works in groups in the beginning or end of class to clarify understanding, and finally debriefs or reports out as a group to the whole class for a discussion of the concepts in class. The whole process would be about 30-40 minutes of class time. Leave a comment on The Active Learning Lecture? Author Patricia DonPosted on May 18, 2016 May 25, 2016 Tags active learning, lectures, student engagementLeave a comment on The Active Learning Lecture? How much should my students be assessed? How much should I grade? The immediate answer to both might be: as little as possible! However, the well-considered answer would be: a lot of student assessment with only a little high-value professor grading. How is this possible? Think back to a time (before graduate school) when you were a student and had an assignment that was graded in such a way that it became a turning point in your academic life. Can’t? Well, that is likely because research shows the way students improve academically is through the cumulative feedback, frequent grading, and the rating of performance over time. Assessment is most effective when it provides a consistent message about standards and practices through frequent and timely feedback that shapes academic behavior by preventing students from repeatedly making the same mistakes. When you formulate your assessment strategy, do not think about what is common or traditional. Instead, make a list of 3-5 activities that improve student performance. Create an assessment program that does an effective job of shaping student behavior through automation of simple tasks. Reserve your personal grading intervention for the higher-value academic tasks. Below is my personal plan for students to achieve the 5 student goals I identified when I went through this process. Take weekly MC/TF online tests on the assigned reading. To improve reading skills by holding students to recommended 150,000 words per term. Zero. Set up automated online grading. Submit weekly reading study guides of key terms online. To conceptualize readings into small chunks that prepare for assessment. Zero. Students are granted participation points for completing assignment. Take up to 8 in-class poll questions online about lectures during class. Submit small group problems online. To collaborate through active discussion of the material in small and large groups. Zero. Use on-line polling to collect and update the gradebook automatically. Give participation points for problems. Formative assessment: Submit 3 parts of the writing process of the paper during in the term. To systematically build an analytical paper and correct errors in the writing process before they accumulate into incoherent writing. Grade 1.5 hours per student for the term, divided into 3 grading sessions. Project-based learning: Submit 3 parts of a research process in the term and works with a research team. To obtain information from varied sources about a topic of high interest to the research team: collaborate, plan, discuss, analyze, and present. Grade 1 hour per group for the term. Up to 3 collaboration sessions overseen in class. Teams present online or in finals week. Write 3-5 pages of information in a blue book in class. To regurgitate what the professors taught or what the student read. 1.5 hours of repetitive grading per student, divided over 2-3 sessions in the term. Write 5-10 page paper to a writing prompt and submit at end of term. To demonstrate the state of the student’s writing skill. 1 hour per student, possibly 1.5 hours to correct the writing of weaker students. With limited time spent grading, you can improve students’ academic performances in a more significant range of skills and disciplinary learning through the smart use of technology. Research calls this the frequent, low-stakes assessment plan. It works well, particularly with the availability of online submission and grading. Professors just need to shift their priorities and make use of the online tools. Do yourself and your students a favor by instituting a new assessment strategy this term. Let us know if you have any questions or if we can help. To Lecture or Not to Lecture? That is Not the Question. Sometimes I am told that I am anti-lecture because I spent much of my career writing active learning pedagogy. That is absolutely not true. I lecture, I enjoy a good lecture, and I see real value in lecture in the college classroom. In fact, experience has shown me that truly great lecturers are usually great analytical thinkers. But I personally find this whole debate about lecturing a non-starter. If you read carefully, most people who advocate for the lecture, and presumably against active learning, actually argue for high-quality lecture and combinations with active learning methods. And people who advocate for active learning do not discount the lecture and pretty much arrive in the same place–advocating a blend of the two. In the final analysis, quality teaching is whatever works in building ever more sophisticated thinking in the majority of students. In my 4 decades of teaching, I have found that no one method has a lock on that goal. The problem as I see it is instructors’ lack of diversity in methods, not the use of a so-called “bad” method. Research shows that the higher education classroom is over 75% dominated by the method of lecture. On the other hand, the high school classroom has migrated over the last 40 years to a very active learning space. Is it better? No one makes that argument. But the truth is that neither classroom has been well-served by taking one side of this useless debate. For example, in high school classrooms today, you see students going from one small group assignment to another with no lecture in between–because of the mantra that active learning is supposed to be good and lecture bad. But what is the result? Many students come to college lacking mastery of knowledge or any sense of the discipline. The students seem to think that the classroom is like a series of “fun” games. I like fun too, but learning is also work. Students seem to be mystified by the idea that they are supposed to do something to further their education outside the social group of the classroom–such as individual study. And individual work is necessary if you are going to read, research, and write–skills essential to graduating and functioning in the real world. But these skills have truly lost ground in recent years in the secondary space. Now the same students come to college and find that the classrooms are, as I said, dominated by lecture. The knowledge being conveyed is more sophisticated but the involvement of the student is pretty low, if the classroom follows that usual pattern of 75 minutes of straight lecture, 2 days a week. This college classroom is an information space, where building the fund of knowledge is emphasized, but not necessarily the student’s ability to do something with it. The interesting parallels in these two scenarios is the following. First, each creates a lot of student dependency on the instructor. Independent learners and confident students are not necessarily being nurtured. Second, if the instructor is not careful, each method can easily and quickly deteriorate into a superficial educational environment with limited learning. So let’s take a look at the advantages of each method when it is done well. It provides quickly and efficiently a fund of knowledge upon which the student can rely to proceed with in-depth study. It models problem solving, analytical skills, evaluative judgments, and passion about the knowledge set forth and the discipline itself. And it creates a narrative glue that holds together all of the active learning sessions, readings, research, and other in-depth study opportunities where students demonstrate their own analytical thinking and expression. It asks students to use knowledge acquired from lecture and reading to do analytical thinking for themselves. It gives students opportunities for both individual and collaborative in-depth learning, both in and out of the classroom. It provides detailed steps and practice in the classroom for how to do analysis, research, reading, study, and writing to assure that all students know what to do outside the classroom and on their own. Can and should they be brought together? Most certainly. More in the next blog about the research on blending lecture and active learning in the college classroom. Leave a comment on To Lecture or Not to Lecture? That is Not the Question. Author Patricia DonPosted on April 25, 2016 May 26, 2016 Tags active learning, lectureLeave a comment on To Lecture or Not to Lecture? That is Not the Question. Take a look at this ranking of most desired skills, which was collected from a survey in 2010 by Hart Research Associates for the Association of American Colleges and Universities. It must be a poll of university professors about the goals of a college education-right? Wrong. It’s a nation-wide poll of employers identifying the 7 essential skills of entry-level employees. It looks like the most-valued skills of today’s knowledge economy are also the goals of the much-maligned American liberal college education. And employers are not just saying this, they are acting on it. 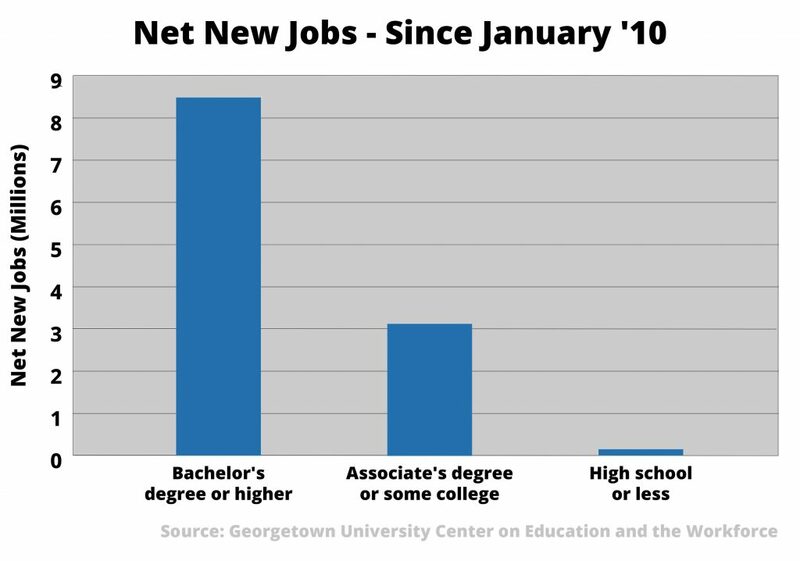 Note the way net new jobs since the Great Recession are overwhelmingly biased in favor of college graduates. We are not often asked to consider that college professors and employers might be on the same side. After all, there has been a lot of discussion today about whether a college education is worth it for two reasons. First, the price of college is leaving students in severe debt. Second, many students who have a bachelor’s degree are not able to get employment in their fields. Therefore, many graduates end up in minimum wage jobs after getting a rather expensive degree. So, are employers blowing smoke when they say they value these skills? The operative word here is “skills.” It is presumed that when students have graduated from college, they will have the 7 essential skills above. Not so. In 2003, the American Library Association published the results of an extensive adult literacy test that found only 31% of college graduates in America actually had college-level reading ability. They did not assess the writing, computation, and reasoning skills suggested above, or the percentage would have been much lower. And that same reading assessment conducted today would probably garner even worse results. We can argue about how we got into a condition where so many students are “inauthentic” graduates. For example, there are the financial formulas of colleges and universities today that cram too many students into classes, so there is little professor-on-student time to assess sophisticated liberal knowledge, let alone train and assess complex skills. Then there is the 3-unit system of the bachelor degree, which rewards students for passive attendance rather than reaching benchmarks of skill and knowledge acquisition. Also, we have the pattern of universities to emphasize “access,” so much so that they admit millions of students each year who simply are not ready for college. But the professoriate also has problems. In the face of data that suggests that students need more skill development and more active demonstrations so that they can blend knowledge, skills, and academic behavior, the majority of professors still regard themselves as primarily transmitters of sophisticated knowledge in their disciplines, and teach accordingly. Moreover, universities and professors tend to ignore, financially and pedagogically, the lower division where the futures of so many disadvantaged and under-prepared students are made or broken. Finally, when faced with an avalanche of students who are weak to start with, there is pressure from the administration and from social media (for example, ratemyprofessors.com) to dumb down the whole curriculum and let students pass through, even though they show minimal or no skill, or even knowledge, acquisition. What to do? A lot of things, even though most are beyond our control because they involve money. But nothing gets done unless you can agree on what you are trying to produce. So, the first thing is to identify what is a successful college education-authentic academics-using a language that professors who train and employers who employ can at least agree upon. Here is the evaluation formula I would suggest.